If George W. Bush ends up in the White House, TheSmoking Gun would like to be the first web outfit toformally offer Dubya an artifact for his futurepresidential library. The Republican's wackyperformance in this 1992 wedding video excerpt--shotyears after Bush went cold turkey in July 1986--needsto be preserved for future generations. 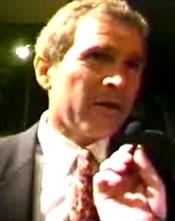 The video was shot at the August 29, 1992 wedding of Jamie Weiss, the daughter of Dubya's close friends Mike and Nancy Weiss. Mike, a Lubbock, Texas lawyer and CPA, was Bush's campaign chairman during his first political race (an unsuccessful 1978 congressional bid) and was one of the Texas governor's earliest political appointments. Nancy, also a Bush appointee,had a prime speaking slot on the final night of the Republican convention. She told the crowd, "I wish you could see how he reaches out to people, teasing those who can take it and protecting those who can't." When cameraman T. Patrick Murray filmed Bush during the wedding reception at a Lubbock country club, the future governor took some rambling--and we presume good-natured--swipes at the newlyweds, the bride's parents, and her brother Kelly (Bush was being quizzed by a member of the bridal party). We love the part where teetotaler George actually disses two of the Weisses for supposedly not drinking or smoking. And as for those weird Don King-like "only in America"cracks--not to mention what's in that glass--your guess is as good as TSG's.